Pastor Jamal Bryant and singer Tweet on the July 29, 2016, episode of The Preachers. Filed under: This is weirder than Birdman and Toni Braxton. 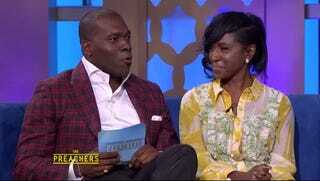 On Friday, Pastor Jamal Bryant let the world know that his “last lady” is none other than singer Charlene “Tweet” Keys. The YBF reports that the fiery Baltimore pastor, who did Freddie Gray’s eulogy and who has had some public issues with infidelity in the past (he divorced The Real Housewives of Potomac star Gizelle Bryant in 2009), has found his one and only. Tweet revealed their yearlong love affair on an episode of Centric’s Being, and Bryant did the same on yesterday’s episode of The Preachers, a new daytime talk show with men of the cloth that has a limited run on Fox stations this summer.